I was interested in viewing what hedgers were doing around a few of the primary commodities trades. Commercial hedgers are considered “smart money”. Sentimentrader.com provides us with today’s charts. The red dashed lines on the charts indicate a “crowded trade” where commercial hedgers are net short while others are long . That’s a bearish sign, given their propensity for accuracy. The green line means they are net long. Follow the smart money—if the hedgers are long, you want to be long, or be wrong!! Here are the charts of a few select commodities taken directly from sentimentrader. I’m only looking at commodities showing high hedging or long positions indicating bullish or bearish outlooks by the commercial hedging community. 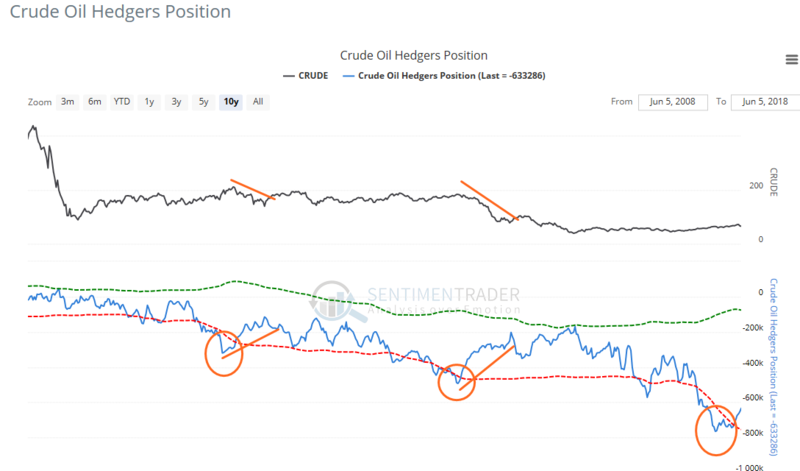 Coming off a net short position by the hedgers (bearish)—you can see that in other years this has occurred the trend for oil went bearish for a while. Current conditions suggest a few more bucks downside for oil based on historic patterns on this chart. Most of the metals are doing almost nothing lately –and hedgers are not taking extreme positions on either side of the trade. The two exceptions to that might be copper and platinum (discussed next). It’s coming off of an “almost” bearish high-hedge ratio by the commercial guys. So far the price isn’t moving violently down, but it is something to keep an eye on. 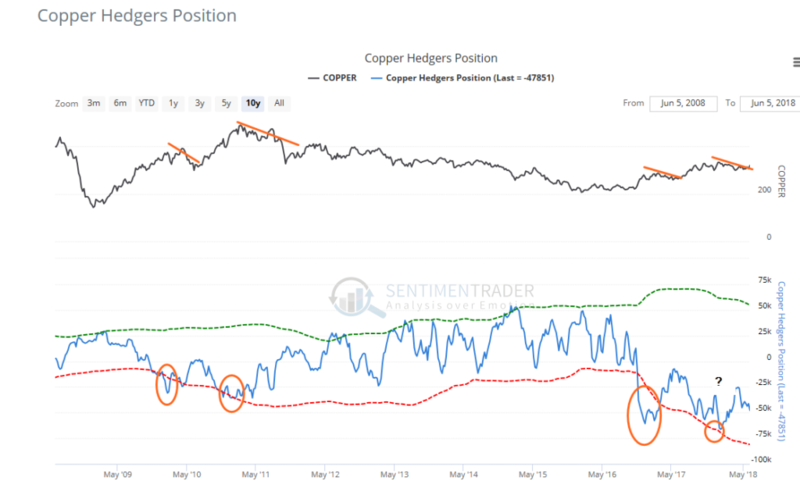 The only other commodity that I could see in a bullish commercial hedgers zone (i.e. where hedgers are net long in a big way…aka the “green line”) was platinum. Seasonality for platinum starts to get interesting in the late fall. 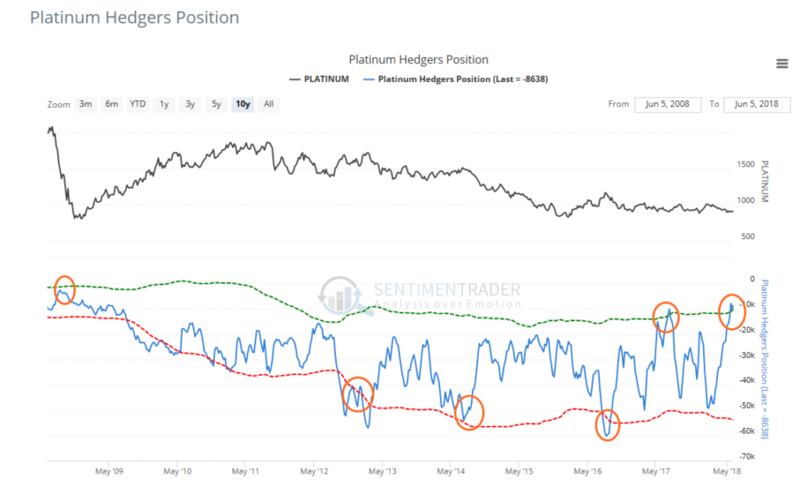 This suggests that platinum might be setting up for a bullish move later in the year or early next year as seasonality meets up with the bullish hedgers outlook.